I’ve always had conflicting emotions about the modern Beetle. In 1997, Volkswagen inflicted the atrocious New Beetle on us. It was a Mark IV Golf with the body of a Type 1 that contracted elephantiasis. On the inside, Volkswagen gave the drab, plastic interior a small flower vase. I’m sure someone at Volkswagen thought this would remind us of the ‘60s when people my age piled into their Type 1s with sights set on San Francisco. What it actually did was pander to little old ladies who like flowers. In 2001 however, Volkswagen made the RSi, a car which is almost cool enough to forgive Volkswagen of their sins when designing the base car. Mercilessly in 2011, Volkswagen gave us a new New Beetle, which is no longer called the New Beetle, but rather just the Volkswagen Beetle. This A5-based Beetle is an all-around better package than its predecessor, but I could never find a reason why anybody would buy one over the Golf. That is where the Dune steps in. The Dune I drove listed at $27,850, and while that may sound steep, keep in mind that Beetles nowadays can be optioned up well into the $30,000s. On the face of it, the Dune drives like every other new car. It has electric power-assisted steering which does its best to imitate steering feel but is overwhelmingly lifeless and its pedals communicate less than a recently divorced couple. Sure, with only 170 horsepower the 1.8 turbocharged inline four is not impressive on paper, but on the road it feels more eager in this application than the same engine did in the Passat. Sure, it’s not fast, but Beetles never were. 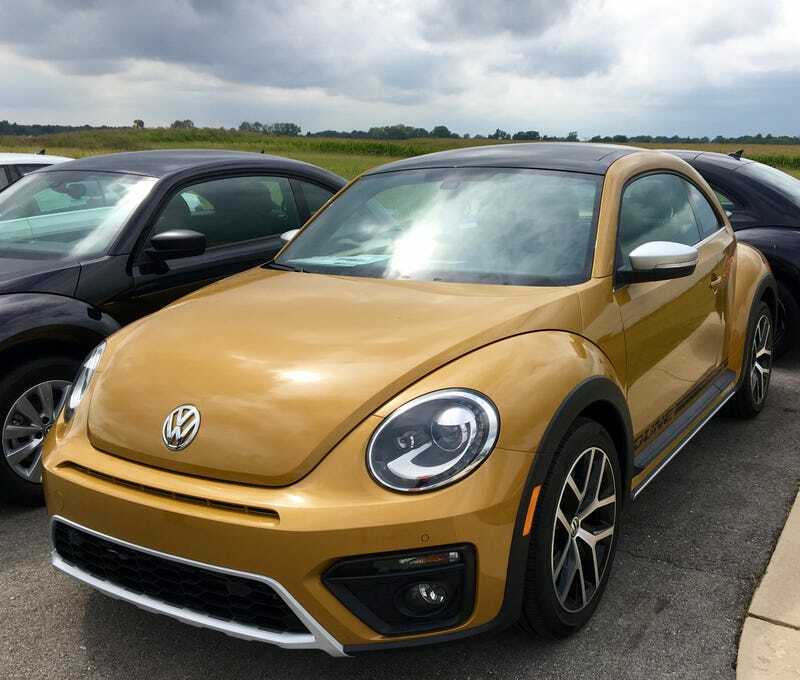 Volkswagen attempted to capture the spirit of the Baja Bugs of the late 1960’s with the Dune, and I think they’ve succeeded. While the fundamental driving characteristics may not be anything to write home about, the exterior color-matched dashboard serves as a constant, glaring reminder that you stand out from the pack and the increased ride height and whizzy little engine ensure you are smiling while doing so. The Beetle Dune is what the Beetle should’ve always been. The standard Beetles are too grown up, too serious. The Beetle is loved because of its simplicity and its silliness and the Dune with its oversized tires and Look at me! metallic yellow paint is about as silly as they come.